Great British Budget Round Up, Tips and Is This The End? Wow, I can't believe how quick this month has gone! Sadly, today, is the last day of the Great British Budget. I have thoroughly enjoyed taking part in this campaign and I have become quite passionate about saving and becoming more thrifty! I never thought I'd say that! But yes, it is true! Are you paying too much for your water? As well as the water you use, bills can also include a charge for the treatment of water that runs off your property (rain) and into the sewers. This is known as a "run-off charge" and not everyone needs to pay it. If the drainpipes that carry water off your roof aren't connected to the sewerage system then you may be able to apply for a rebate of between £17 and £50 a year. You'll probably have to fill in a form and the water company may want to visit your home, but if you can prove that no water runs from your roof into the sewerage system, then you won't have to pay the charge." This is something the we will be looking into as I was unaware of this. We pay our water bills by direct debit for 8 months of the year and don't pay that much so I doubt that we'd get a rebate but it is certainly worth looking into! Many of us now shop online for anything from clothes to holidays. Although it's possible to find good bargains online, there could be even more savings if you know where to look. Voucher codes can help you to save money on everything from groceries to luxury goods and meals out. If you're short on time, websites like vouchercodes.co.uk collect voucher codes for you - so all you have to do is find the code and enter it when you shop. 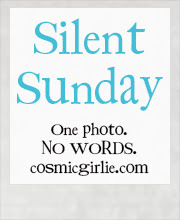 But remember to check when the code expires! This is a website that the hubby regularly checks if we are going out to eat as they often have vouchers for our favourite restaurants! We often take out with us 20% off vouchers which are a huge help as we cannot afford to go out often! If you're struggling to stick to your budget, have you tried only using cash? It's likely that your essential spending such as bills will come out of your account by direct debit, but sticking to cash could help you keep your disposable income on-budget. You could work out how much "spending money" you have at the start of the week, withdraw it from an ATM and then put your bank card in a drawer for emergency use only - that should help you avoid impulse purchases! This is a tip that I am a huge fan of! In the first week of the Great British Budget I took the leap and went shopping without a card and only took cash and my calculator! I did save money by only buying what was on my shopping list and even got some change! Consider turning that weekly lottery ticket into a savings plan! If a weekly lottery ticket costs £2, if you save what you'd spend each week that's £104 a year. Likewise other small spends such as a bar of chocolate at the paper shop or a daily coffee can quickly add up. Why not consider contributing your weekly lottery spend, or other weekly expenditure to a savings account instead? It might not give you the same rush, but it can actually be pretty exciting watching your money grow! I used to do the lottery, but after realising how much it amounted to over the year I did stop! If you win it is fantastic but for the majority of us it is money wasted! It is better being saved and you will then see some benefits! This month we have had a successful month. 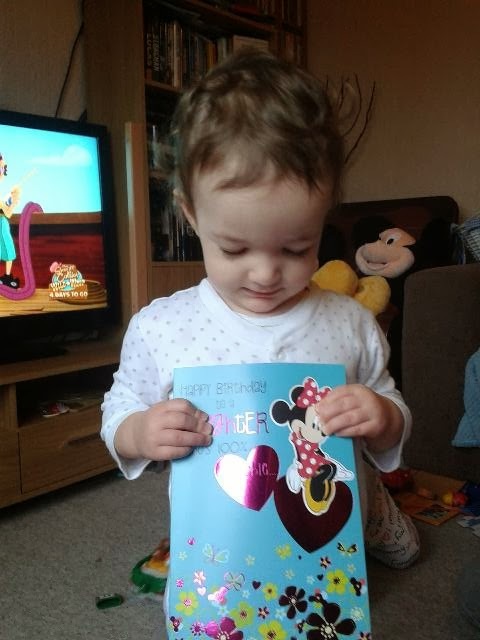 Yes we have had extra outgoings as it has been the twins birthdays and things have gone on the credit card. However, what we have got on the credit card is a manageable amount. We know that we can pay it off before we get charged any intrest. We have simply cut back in other areas, we have been budgeting more on our weekly shopping and simply watched what is spent and where! This Great British Budget has made us think more about ways to save money and we have picked up some tips which will continue to be used! We are still working towards our goal of not needing to use our credit card but with so many other things to pay for it is difficult but I am sure that we will get there, one day! Great British Budget - The End? I have really enjoyed taking part in this campaign and certainly do not want it to end here! 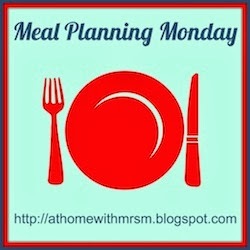 I am planning on doing a new weekly post of a budget meal. I hope to show you that you can still make delicious, tasty, home cooked meals on a budget and want to post a budget recipe each week. So keep an eye out for this and also a Great British Budget twitter party on Monday! Last week when we went shopping we picked up some lovely rhubarb. The hubby really wanted a crumble, however I had planned a cake. So I combined the two and came up with this great compromise! We also had a lot of bananas that needed using. I did a taste test of a little of the stewed rhubarb with a little mashed banana and loved the sweetness that the bananas added. 1 - Place the rhubarb in a pan with the caster sugar and water, bring to the boil and cook until the rhubarb has softened. Once the rhubarb is done remove from the heat. 2 - When the rhubarb has cooled a little place a sieve over a bowl and remove the juice from the rhubarb. 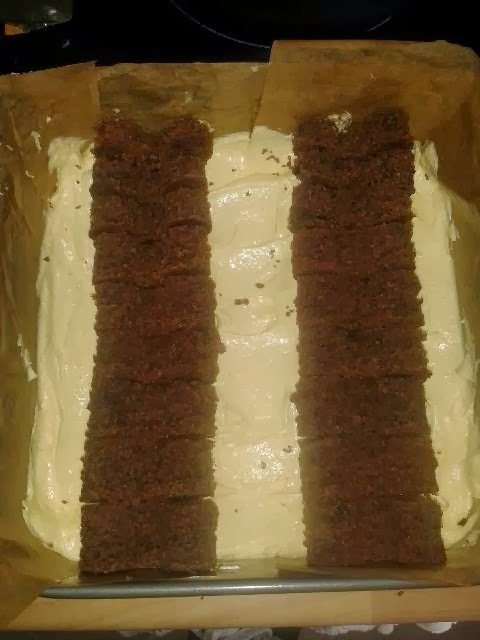 3 - For this cake I used the all in one method. Place the baking spread, sugar, flour and eggs in a bowl and mix until all of the ingredients are evenly combined. 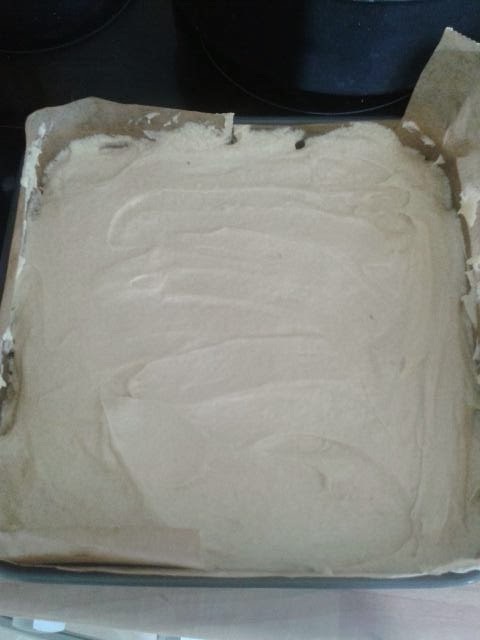 4 - Grease a square cake tin and add the cake mixture. 5 - Mash up the bananas in a bowl and add the rhubarb. Mix until both are mixed together evenly. 6 - For the crumble rub the butter in with the flour until you have a rough breadcrumb texture. Add the muesli. 7 - Layer the fruit on top of the cake mixture. 8 - Add the crumble topping. 9 - Place in the centre of the pre heated oven and bake for about an hour, checking regularly after 45 minutes. 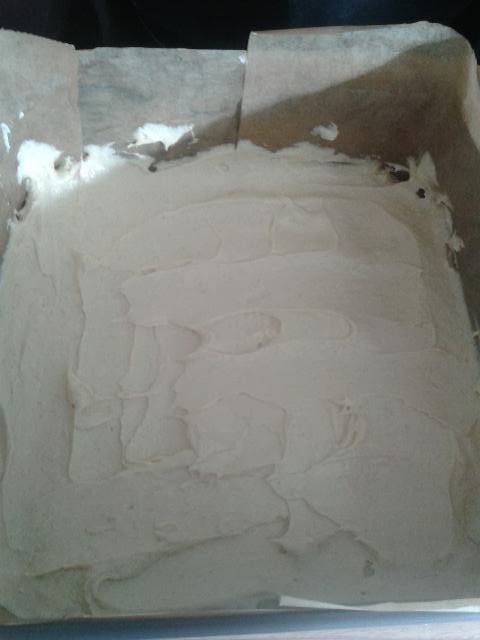 10 - Once the cake is thoroughly baked leave to cool in the tin for 45 minutes before gently removing from the tin. This cake is delicious when eaten as soon as it is out of the tin and it is still a little warm. It is even better with a serving of cream which transforms it into a warming pudding! 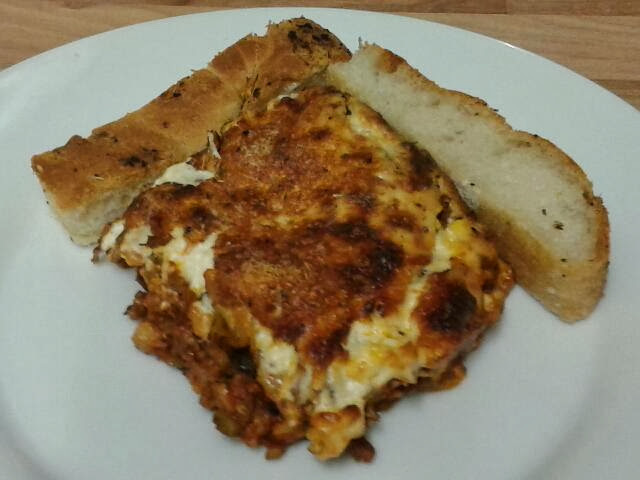 I have shared this recipe with A Mummy Too's Recipe of the Week. Check out Recipe of the Week for some delicious recipes! 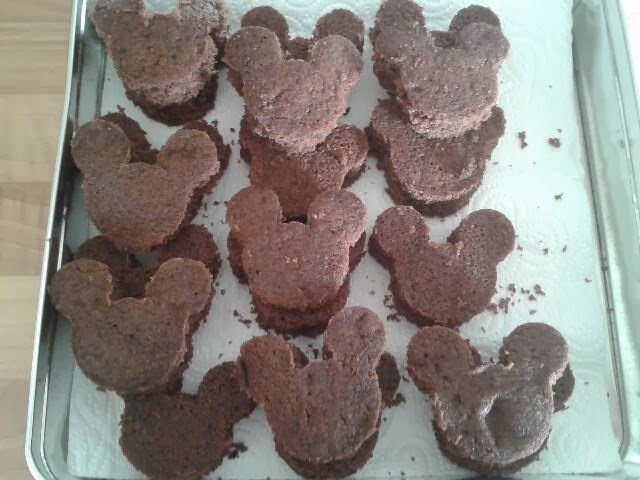 I spent a lot of time planning what I was going to bake for the twins second birthday cake. I will admit that I did have bigger plans for this cake. I had planned to bake the cake over two days and send the third day decorating it ready for their big day. Unfortunately the whole family, including myself, fell ill. So this meant that I did not have the time that I wanted to prepare and decorate. However, even though this cake was done quickly and not as I had originally planned, I am still really pleased with the outcome and the twins loved it! When they saw it they kept say "Clubhouse Cake!" then when they saw what, or should I say, who was in the cake they loved it even more! 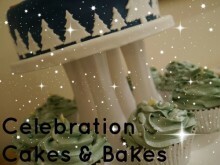 Once the cake has cooled you can decorate as you wish. I covered the cake with a thin layer of strawberry jam and butter icing before covering with fondant icing. 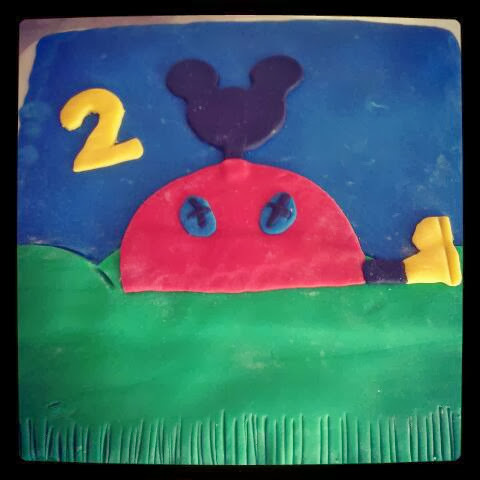 I then decorated the top with the Mickey Mouse Clubhouse picture. 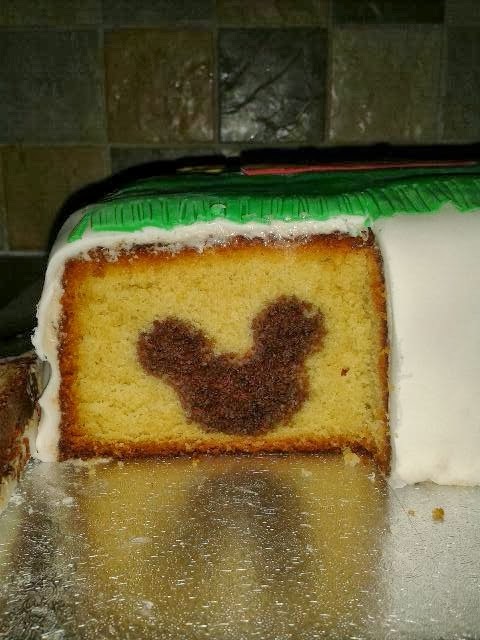 This was the first time that I have baked a cake with a hidden surprise and will not be the last, it certainly had the wow factor when people were served their cake with the Mickey Mouse shape in the middle! During my twin pregnancy I worried everyday. Labour started at 34+6wks and midwives supported us through the emergency c-section and kept our babies safe until nicu took over. 3 days later my nanna died. After a week in hospital, babies in nicu and loosing nanna I was near breaking point. A midwife spotted how I was close to pnd and gave me the best advice. She reassured me our babies would be ok and that I should go home. Leaving was the hardest thing ever but she was right, I became stronger for my children. I have written this 100 word piece about my experience with midwives as today Save the Children are starting their new campaign #FirstDay. I was amazed and saddened to read that every year 1 million babies die on their first day of life! This is a staggering figure that Save the Children want to reduce, hence this new campaign. There are a number of ways in which you can help. * Sign Save the Children First Day Petition - David Cameron could lead a global break through by encouraging the world to provide more training and funding for midwives. Please sign the petition asking him to sign up to Save the Children's Newborn Promise, a plan which aims to ensure that by 2025 all children are born with the support of a midwife. Thank you for taking the time to read this post and I sincerely hope that you will support this great cause! Please visit Thinly Spread's post about why she has raised awareness throughout the blogger community of this cause and read some other 100 word posts. Joseph would probably tell you that I moan at him to read! Well I used to, thankfully I don't any more! When I got the chance to write a review for Reading Chest I saw this as an opportunity to encourage Joseph to read more and not just because he had to. Both the hubby and I love reading. We really want all of the children to learn how much fun you can get from a book! I signed up with Reading Chest on the Friday and I was amazed to see that the books were delivered by the postman the very next day! This really was an excellent and speedy delivery! Joseph was so excited to see the arrival of a package. The envelope was address to specifically for him which added to the excitement. He ripped open the envelope and was surprised by all of the added extras that came with the book. * A pre paid envelope for him to return his books once he had read them. I couldn't believe how eager he was to go and read a book. It was immediately visible to see how enthusiastic he had become. He was so animated as he told us all about the first book that he read and couldn't wait to tell us what had happened! He was, finally, discovering the magic of books! I felt so proud when he told me about the book, I could see how excited he was that he had read it and enjoyed it! 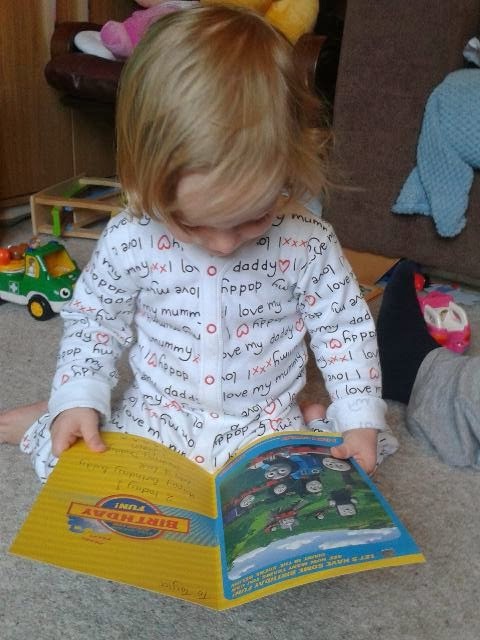 From the first package, he read two of the books in just three days! Unfortunately with the council budget cuts a lot of libraries are being shut which is taking a service away from children. So the service that Reading Chest are offering is a different way for children to get the books that they need﻿. Reading Chest are a postal book rental service for children from 4 - 9 years old. 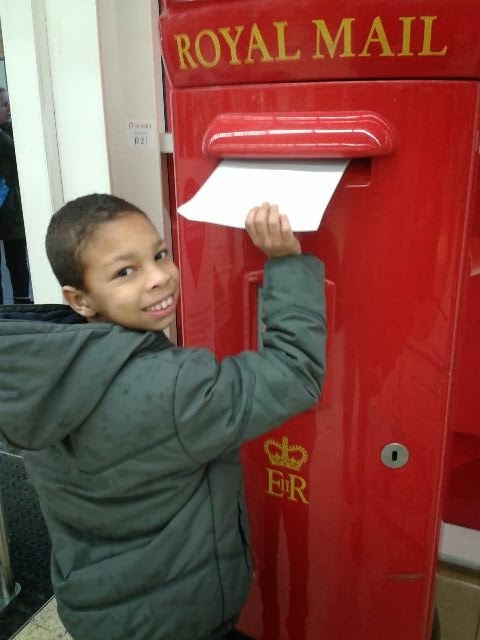 Once the books have been read, or if your child does not like the book and wants to swap, you simply place a maximum of three books in the pre paid envelope and post them back to Reading Chest and await your next delivery. 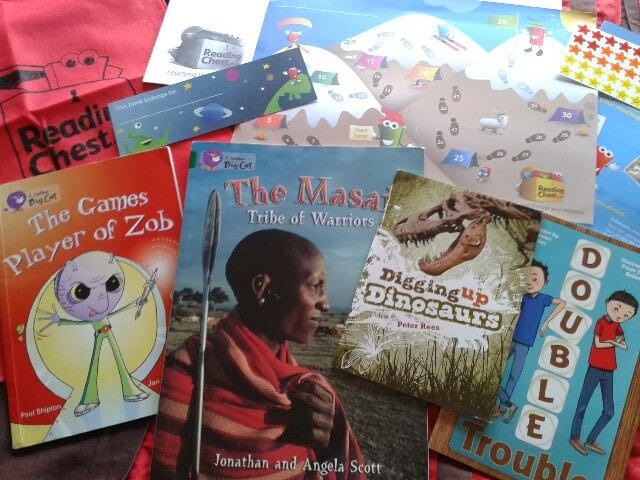 The books that are available run alongside books that are used in primary schools so you know that your child is reading books which are at their level. You can also change the level of reading books as your child's reading improves! There are both fictional and non fiction books available. Joseph has had a mixture of both which he has enjoyed as the non fiction has widened his knowledge in the wider world, however the fiction books have definitely been his favourite! The silver and gold packages are ideal if you are looking to sign up for more than one child. Prices start from £9.95 a month but with discount code HAPPY2014 you will get £5 off your first months membership! Disclaimer: Reading Chest gave us free membership to the silver package for the purpose of this review. No payment has been recieved. All views and opinions are my own and 100% honest. It is the last week of the Great British Budget and I have to admit that we are having a few treats this week! Last week our shopping list was quite small so we allowed ourselves the same budget and bought a few items of food that we would normally not buy on a regular basis purely because of the price. We have also kept within budget over the last month I believe that we deserve a treat. Last weeks meal plan, again, did not go as I had hoped. This was down to illness, again, but this time on my part. Now that we are all back to our normal healthy selves I am looking forward to serving, and eating, some delicious meals! I have to admit, this is not a homemade pie. It is one that we treated ourselves to from the farm shop when we went out for the twins birthday. However it is one that is freshly made using organic ingredients! I will be serving the pie with baked French potatoes layered with onions, spinach and ricotta, french beans and carrots. This will be served with roasted sweet potato and crunchy baby sweetcorn, sugar snap peas and french beans. 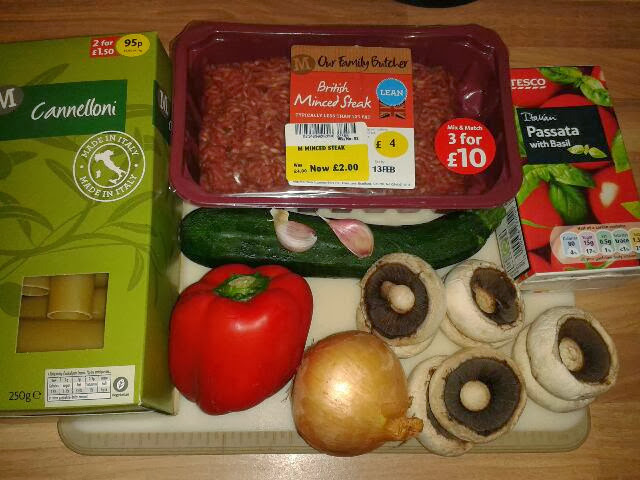 I will slow cook the stewing steak in a tomato sauce with red chilli, green chilli, red and green peppers, onions and kidney beans. It will be served with creamy mash potatoes. There will be, no doubt, plenty of leftovers from the slow cooked chilli beef. I will bulked it up with extra vegetables and add courgettes. I will serve with freshly made wraps and rice. This risotto is an easy, quick meal that is delicious with Parmesan cheese sprinkled over the top. The cod is baked with peppers, onions, oregano, basil and tomatoes. When the fish is cooked I sprinkle over a cheese topping and grill. This will be served on a bed of tagliatelle. 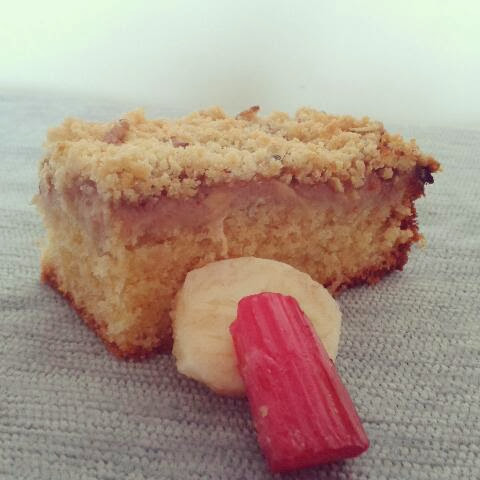 There will also be plenty of homemade bread, ginger tea loaf and I am planning a new rhubarb pudding too! I love baking bread and this is a recipe that I have been meaning to try for a long time! It is a recipe from the book that started me on my bread baking journey. 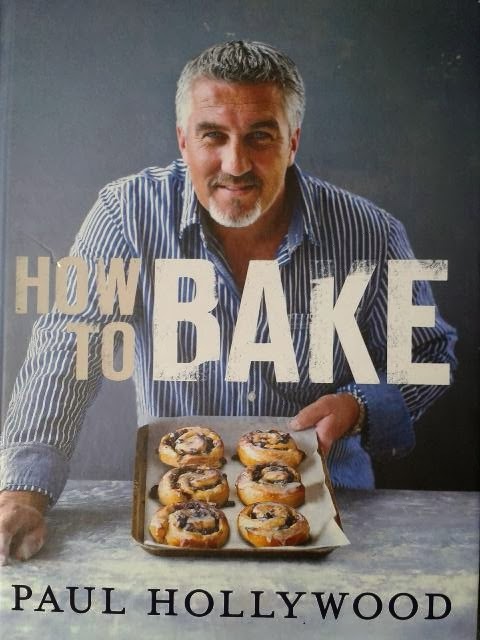 That book is How To Bake by Paul Hollywood. 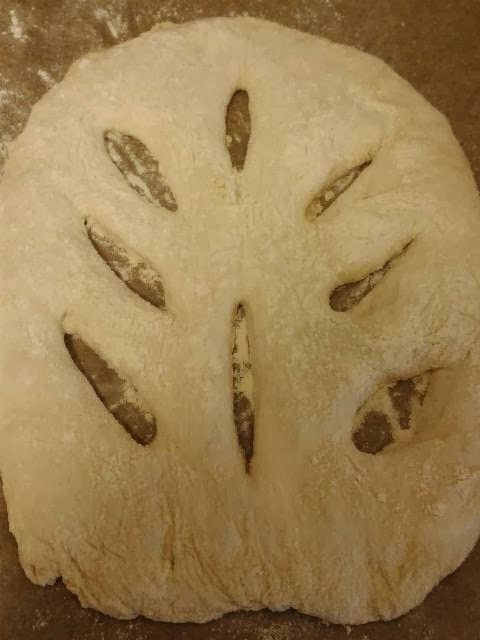 Fougasse is the French version of focaccia, which is a bread that we always enjoy and one I love trying new flavours with. We found that this bread has a much more crispy crust than focaccia, but still as tasty and fun to shape! The recipe uses oregano for the finish. 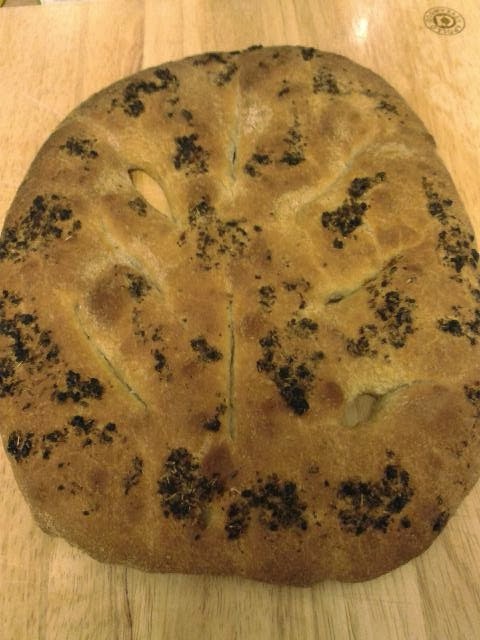 As this was a bread that I planned to serve with my beef and vegetable cannelloni I decided to make a garlic and oregano olive oil topping for the bread. This bread is a delicious alternative to garlic bread and would go perfectly with any Italian meal! This hasn't been the best week for us. The week started off with all of us being ill, and this meant when I was really ill, I missed a days picture! I have also decided to not follow the daily prompts. They were fun to start with but then ended up being prompts that didn't suit our day or I felt weren't relevant to us, so I have given up! My pictures are going to go back to what we do and our days, which is the reason why I started to take a picture a day, to record our year! Taylor was the first to get poorly at the end of last week he was well and truly ready to get out for some fresh air now he was feeling better. 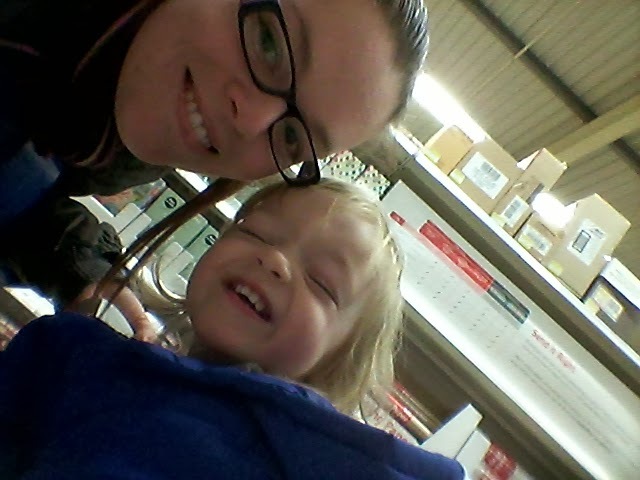 As Isabella, Joseph and hubby were all poorly and I needed to go shopping I decided to take Taylor out with me. Having 3 children, twins in particular, it is so rare that I get chance to go out and spend time on my own with just one of them so this was a real treat for both Taylor and myself. On Tuesday I was out for the count! I started being ill Monday evening and was up and down all night. Thankfully hubby managed to finish work early and my mum came down and had the children for me. Thanks to the sickness bug I missed a day for my year in pictures! However I took more during the week in an attempt to make up for it! On Wednesday I was still not 100% but had improved a great deal. I was over the moon with a delivery that I received. 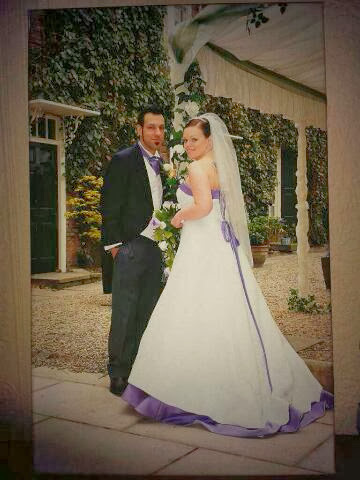 Our beautiful wedding canvas arrived! After we got married we said that we'd get a canvas done but we found out we were having the twins and shopping for them became our priority! So when I got the chance to review a canvas I immediately knew what picture I'd ask for. Happy Birthday Isabella and Taylor! I can't believe that our babies turned 2 this week. I really do not know where the time has gone. As they were still not back to their usual busy selves we decided to have a family day relaxing at home. Hubby had taken a couple of days off so that we had a long weekend together. I still had their birthday cake to make so we decided to postpone their birthday outing until the weekend. We had a trip into town today and went around the market. Hubby took me to a delicatessen that he likes which is near to his work. It is very rare that we go into town and it made a lovely change. We called into hubbys work to show the children where he works and to show them off a bit! The kids loved it! 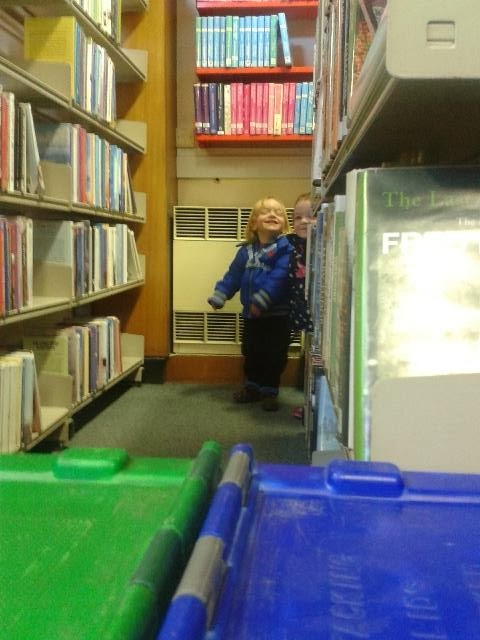 Hubby works for the library service and the twins were in their element running up and down the book shelves and hiding. The twins birthday cake was also made and all ready to ice on Saturday. Saturday was the twins day. 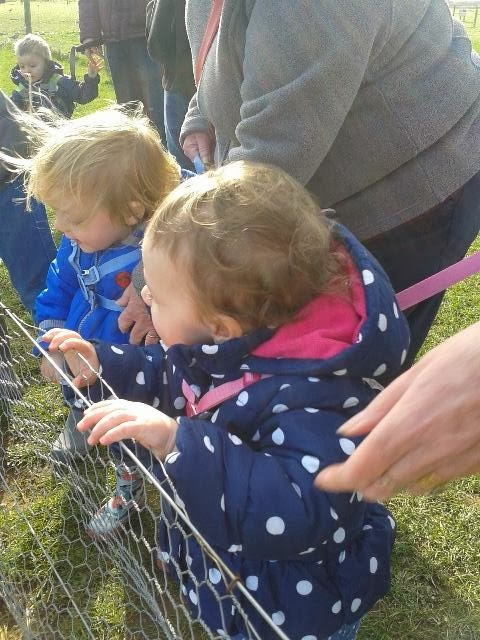 We took them, along with their nanna and gran, to an organic farm and play area. They loved being out in the fresh air and seeing the animals. The highlight for Taylor was all of the tractors! We even came home with a Peppa and George! We visited the farm shop that was there and came home with lots of treats! We really did have a lovely time. We finished the afternoon off with a little tea party and birthday cake! The twins finally have their appetites back. It has been a long and worrying week. They really have not been themselves and have turned away when offered any food so to see them want food again was a relief! 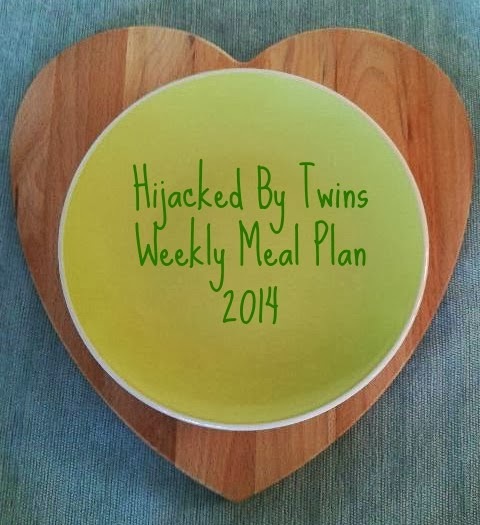 Now that we all have our appetites back, next week we are going to have a really healthy week. Our meals are going to be full of vegetables! 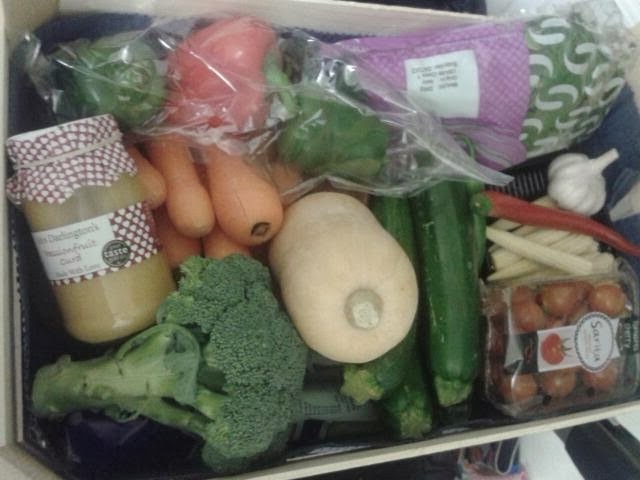 I have got a lovely box of fresh vegetables which should build up all of our vitamin levels and get some colour back in our cheeks! This week has been such a mixture of highs and lows but we have had a lovely end to the week. We have celebrated our babies and have had 4 days of quality family time! I think that I will actually miss the hubby when he goes﻿ back to work and we get back into routine of school and housework! I love Italian food and pasta. 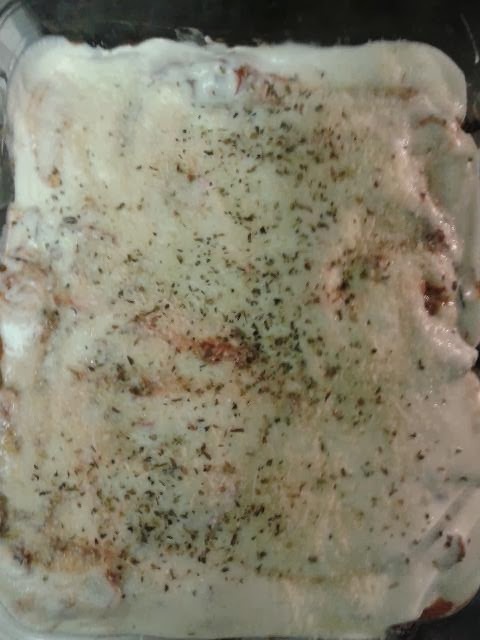 I especially love cannelloni but have not made it in a long time. This has mainly been because where I normally do our shopping do not have it in stock. However the last couple of weeks I have been going to a different shop and I was excited (I did actually get excited about pasta!) 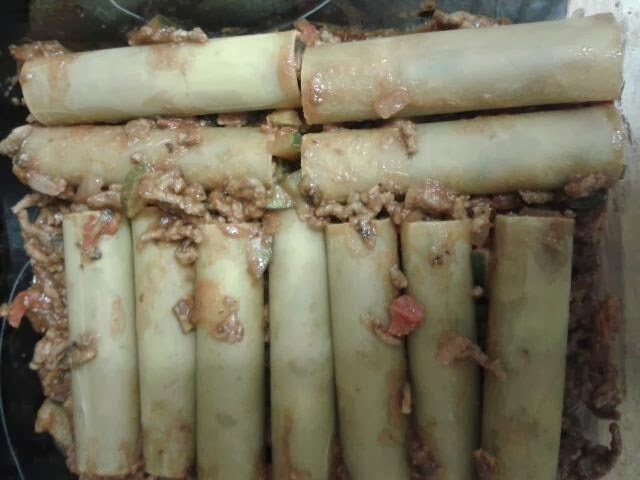 to see that they had cannelloni. I will admit that it is such a fiddly meal to make but it really is worth the extra time and effort. This is a delicious dish which has some of my favourite flavours. 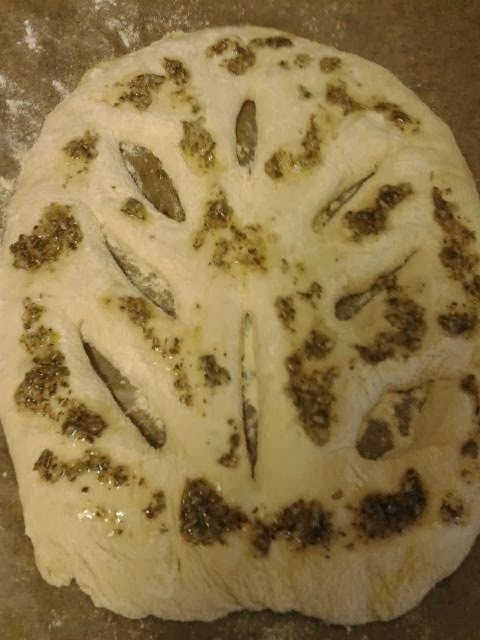 We enjoyed it with some of my freshly made garlic and oregano fougasse.